4 Bedroom Terraced House For Sale in Sheffield for Guide Price £285,000. 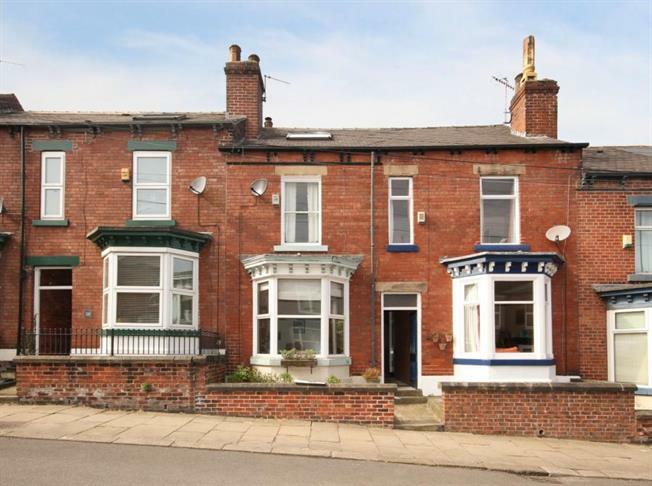 A superb, four bedroomed, Victorian terraced house, with two storey off shot extension to the rear, offering deceptively spacious accommodation & situated in the heart of Sheffield's most sought after areas, within walking distance of Ecclesall Road as well as the beautiful Endcliffe Park. The location is ideal for Banner Cross & Hunters Bar shops & has great transport links. Catchment area for excellent schools. This property must be viewed at the earliest opportunity & would be the ideal purchase for the first time buyer/young professional or families alike! Retaining some original features, including partial sash windows & feature open fireplace, but benefitting from gas central heating and NO ONWARD CHAIN INVOLVED. The accommodation in brief comprises: Side entrance lobby, bay fronted lounge with feature fireplace, rear facing dining room with multi-fuel stove, stripped floor boards & access to the cellar, open plan to the beautiful off shot kitchen with a selection of wall & base units & integrated electric oven, gas hob, extractor & dishwasher. A space for a free standing fridge freezer, plumbing for a washing machine. A modern large glass door from the dining room leads out to the rear garden. First floor landing: master bedroom with front facing sash windows & storage cupboard, rear facing bedroom two with sash window & large storage cupboard, part tiled bathroom with white suite comprising of bath, wash hand basin, wc & shower cubicle with shower and benefitting from under floor heating. Second floor: attic bedroom with front facing velux style window, a further double attic bedroom with rear facing velux style window. Outside: Delightful rear enclosed garden with flagged sitting area with a brick built store/workshop. Location: Peveril Road lies off Endcliffe Park, within a short distance of Ecclesall Road with ample shops, cafes, restaurants and bars.